The AmeriGlide 325M 3 Position is a three position lift chair packed with great features. It has a full chaise pad for total body comfort, is built with a heavy duty lift mechanism that can bear loads weighing up to 325 pounds, and includes a one-year in-home service warranty to cover any necessary parts or labor. Curbside delivery by definition means the trucking service will park in front of your home and you are responsible for moving the product into your home or business. The driver does not assist with bringing product to the residence (additional inside threshold upgraded service can be purchased separately). This service is a request to have the carrier remove the product from the truck in front of your home and deliver through the first threshold on the ground floor of the home, no farther, barring physical obstacle. To ensure that Inside Delivery is an option for you, please measure the door to your home (ground-level) to ensure that it is at least 36" wide (the standard width of the box). If the product does not fit through the threshold, it will be left in the first dry area available. Customers are required to be available during the assigned delivery window. Note: Inside/Threshold delivery is based on specific carrier tariff rules and liability. This service cannot be guaranteed. If service is unavailable at the time of delivery, consumer must note service failure on carrier delivery receipt, (e.g. : "threshold delivery not performed"). Refunds will not be allowed without proper proof of delivery with service failure notation. Micky Mouse from 9700 Seafield Pl. Bristow, Va. 20136 would recommend this to a friend. Old with a lot of problems. Its very comfortable and is nice and quiet lifting. Not crazy about the color. Need more color choices. Other than the color I love it. Fussy from St Cloud, Fl. would recommend this to a friend. I have had a more expensive lift chair and this chair is with one exception equally comfortable and convenient as the more expensive chair. The padding at the top of the chair back is not low enough when the foot support is extended. To be comfortable I have to use a sofa pillow to support my neck. Very convenient and the delivery personnel were very helpful. The chair looks very good. Margaret the social worker from Austin, Texas would recommend this to a friend. Glad that I made the purchase. Mamasan from Rochester, N.Y. would recommend this to a friend. Seat could be a little more plush. This is our lowest priced 3 position lift chair, for those who don't want to skimp on quality. Three different colors to choose from, so it will match almost any home. Ability to lift up to 325 pounds. 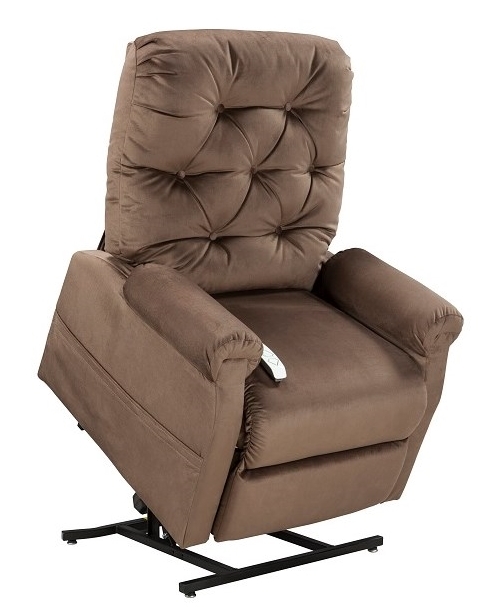 This liftchair is perfect for those trying to find a bargain, without sacrificing quality.